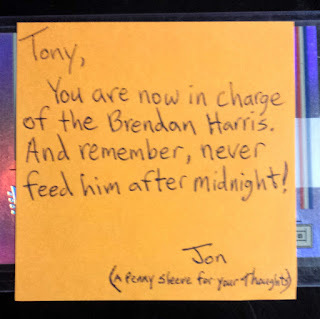 The other day, Jon from A Penny Sleeve for Your Thoughts (one of my favorite blog titles; I adore a good pun) wrote about a disappointing experience he'd had with one of those 100 card Fairfield repacks. 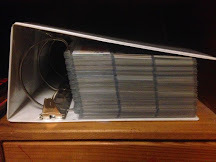 It had apparently been dropped at some point because every card contained within featured a bent, bottom left corner. To make matters even worse, it was the 1:4 that contained a hit as well. You can kind of see it at the bottom there - not too bad, but enough to be annoyed, that's for sure. He mentioned that maybe a Cubs fan would have wanted this if it hadn't been damage; however, I'm a Cubs fan who doesn't care too much about condition. Not to mention, I don't think a Brendan Harris auto carries much value even if it's Gem Mint 10 anyway. Generously, Jon mailed the roughed up signature my way, without any hesitation or request for compensation. What a nice gesture, right? WRONG!! It was a trap! Did you read that? Starting at line three "And remember, never feed him after midnight!" As a connoisseur of 80's films, I know what that cryptic sentence implies. 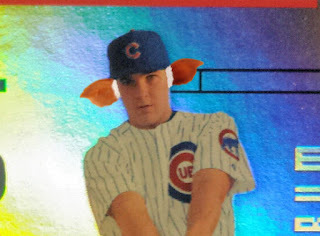 This isn't just a Brendan Harris baseball card from the 2004 Playoff Absolute Memorabilia brand... no, no, no... this, my friends, is a mogwai in disguise! Anyone who has seen Gremlins will tell you, these cute, cuddly, Furby-like creatures are fun and playful at first; but, get them wet or allow them a midnight snack and things will change in a hurry. When they transform into hideous and mischievous gremlins, fun is the last thing you'll be having. I didn't ask for this responsibility! I thought I was just being the beneficiary of someone's good nature, not the victim of a cruel "tag, you're it" situation. EGAD!! How did I not notice that when I inquired about the card?! No, I am afraid to even remove the creature from it's protective top-loader. I mean, if the mogwai has the temperament of the loving and altruistic Gizmo, then everything should be find. However, if he's more rebellious and intent on changing forms, like the evil Stripe, chaos could be imminent. *Of course all of this is being very playful. Jon, thank you very much for sending this dented beauty my way. I'll make sure to find some stuff for your set collecting goals, ASAP. Don't you dare send that card to me. Don't even think about it. No one needs that kind of responsibility! I'm glad he found a good home. Probably my favorite post yet! Finally Found the 1 in 4! Free? Why, That's My Favorite Price! Definitely 2016 Topps - FINALLY!